Park(ing) Day is Friday September 16th year. What started with a 2-hour demonstration in San Francisco in 2005 has grown into an International movement with 850 parks in 30 countries in 2010. 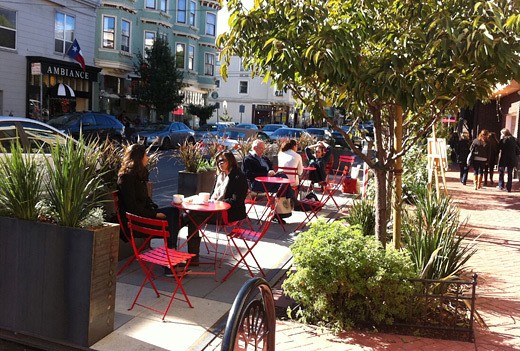 The idea is to take over a metered parking space for a day and turn it into a public park showing how much change can come out of a small area of land and also demonstrate that our streets and parking spaces can be redesigned to be more efficient, safe and green. Although this doesn't immediately scream "green stormwater management" since we are not proposing to rip out the concrete and asphalt, we are making a statement about the way people interact in public spaces and streets and how green elements can make those interactions and spaces safer and more enjoyable. In my opinion, stormwater management starts with creating a connection to public open space and realizing that decreaseing impervious area creates more opportunities for communities to use excess space for beneficial uses. What is the point of putting a stormwater street tree trench or a rain garden where no one is going to see it? This year, Bloustein students led by RAPPS and Walk Bloustein/Bike Bloustein are creating a parklet in New Brunswick. To get involved in this world-wide urban revitalization movement, come to an interest meeting in the Bloustein Student Lounge Wednesday September 7th at 4 pm.